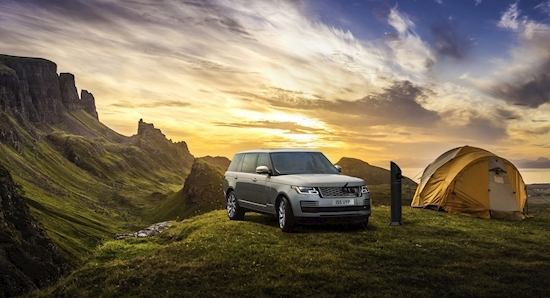 Land Rover has come up with an idea to install the UK’s most remote charging point, located in reach of Range Rover and Range Rover Sport P400e drivers visiting Scotland’s Isle of Skye. Unfortunately, it’s just an April Fool’s prank, although that doesn’t mean that people wouldn’t appreciate knowing there’s a charging point some 15 miles (24 km) away from the nearest road at some highly picturesque location. According to the British automaker, a weary traveler could charge up his or her plug-in hybrid Range Rover in “as little as 2 hours and 45 minutes,” which in turn should mean you get plenty of time to take in the epic view. “We really have gone above and beyond, and ohm-mitted nothing in our quest to ensure that eco-minded Land Rover owners are able to adventure in zero emissions comfort. It may only be one single charging point that we’ve installed, but we’re not expecting there to be much of a queue,” said JLR’s head of vehicle charging, the appropriately-named Max Watts. If this was for real, it really could benefit Range Rover P400e owners, which have a 300 PS 2.0-liter four-cylinder Ingenium petrol unit and a 116 PS electric motor at their convenience. Put it in all-electric mode and the P400e will be able to travel for 30 miles (48 km) without taking a sip of gasoline. “We’re extremely glad that some bright spark at Land Rover has decided to install a charging point in the wilds of Skye. It’s a business that understands the need to maintain the beauty of nature, and this new charging post is so discreet that it’s almost as if it’s not even there at all,” added Skye High Club CEO, the completely made up Ted Lightly. Remember the self-leveling tax disc? Land Rover is no stranger to coming up with “interesting” ideas on April Fool’s. Remember their self-leveling tax disc from 2011? You probably don’t, so here’s a video depicting it for you viewing pleasure.